← Are you a Leader in Your Own Life? Recently I had sinusitis and bronchitis. Congestion, coughing, and difficulty breathing made me lethargic, and I laid around, reading cozy mysteries. A friend told me that colds happen in order to slow us down. At first I dismissed her comment because my life is not overly fast-paced, but then I decided that perhaps this illness was giving me time to reflect on my life. I need to take better care of myself. Another clue to this was that my pants had become too tight, even though I lost weight from being ill. This past winter was particularly fierce in the Chicago area, and I did not walk as I do most winters. I realized that I’d gotten out of shape, and I started walking every day as soon as I felt better. I also joined Weight Watchers. I have seasonal allergies, but they were under control until the day I was unable to breathe for a few seconds. I was choking, although there was nothing in my throat. My sister watched me gesturing and said, “Can you talk?” Somehow I reached deep within to push through a little air. This incident was frightening and reminded me of my mortality. When have you thought about your mortality? I went to the doctor the next day who said my airways had probably been blocked by postnasal drip. She gave me an inhaler, but later I realized I had left without a plan to prevent this from occurring again. Instead I accepted my doctor’s statement that “Your allergies are under control.” My doctor is not fully to blame—I should have been more assertive. I am responsible for my health. Are you assertive when talking to others? My symptoms kept getting worse, and I went to an Immediate Care doctor on the weekend. By then, I had developed a sinus infection and bronchitis. After a complete change of medicines, I started to feel better. I’ve decided to look for a primary care doctor like this Immediate Care doctor, who addressed all my concerns. Are you proactive regarding your health? While reflecting on my sickness, I looked for bright spots. My daughter Katie tells me that while I lay in bed coughing, our dog was pressed against the gate that keeps him downstairs, listening to me cough. It’s nice to know that he and others care. Friends and family checked on me and sent well wishes. Have there been any bright spots in your recent challenges? Have you checked on family or friends who are not feeling well? Finally, I reminded myself to put my illness in perspective. 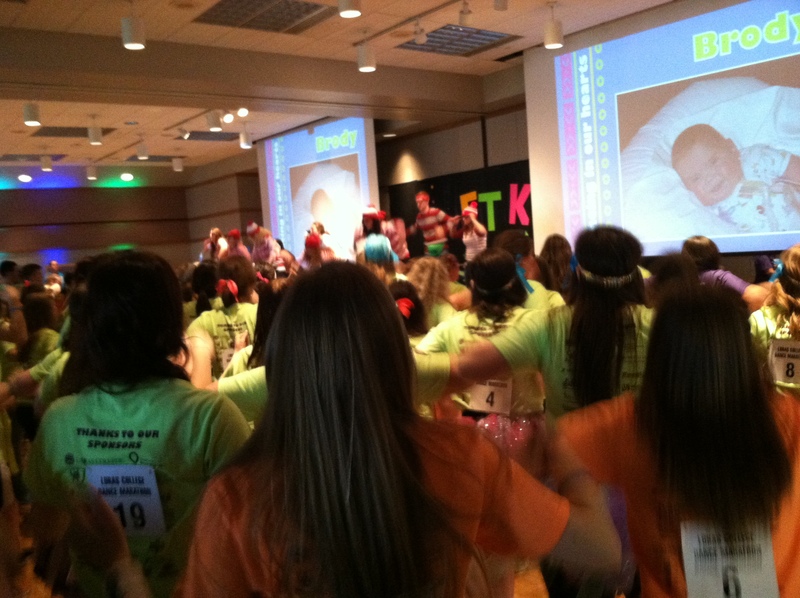 Before I got sick, my husband and I attended a Dance Marathon fundraiser that my daughter Mel helped run to benefit patients of a children’s hospital. More than a dozen “miracle families” told their stories at the event. There were few dry eyes in the room when parents talked about children that had passed away or children fighting for their lives. One 9-year-old boy has been through 35 surgeries and still is fed through a tube. Thinking about other people’s challenges made my own seem less momentous. Have you taken time to reflect lately? What have you learned? This entry was posted in Challenges, Healthy living, Proactive, self-care, Solitude and tagged Challenges, Healthy-living, Proactive, Self-care, Solitude. Bookmark the permalink. Sue, I agree, we want to be good role models for our kids. Mine are grown too, but they’re still watching what I do. They’ll follow what I do, not necessarily what I say. Thank you for your insight. Wow. It’s amazing the things we can learn through illness/setbacks when we have eyes to see. You certainly do. I’ve struggled a bit with my health lately, too. I was feeling discouraged until I began to see it as a gift. It was a needed check to my doing-too-much-again routine. Very nice article. We all need to reflect every so often. Susan, It was smart of you to go to another physician when the other one wasn’t paying attention. Your bronchospasm was potentially very serious, even life threatening. Do you need an epi-pen in case this happens again? Was there any precipitating factor that you could point to? Anything you ate, perhaps? Have you been worked up thoroughly by an allergist?. Moreover, it is VERY unlikely that any such bronchospasm – or even any airway mucus – would be caused by post-nasal drip. That stuff goes down into the GI tract along troughs next to the larynx; it doesn’t get into the respiratory tract. You would have the same kind of reaction to that as you would to food swallowed “the wrong way.” It’s disturbing, because this is the second time I’ve heard of a medically trained person talking about mucus from the nose getting into the respiratory tract. I wonder where they got their training! The mucus in the respiratory tract is produced by glands and cells lining the tracheo-bronchial tree. Your idea of getting a new doctor is a good one. Joanne, you’ve asked some very good questions and told me things I didn’t know. I will get to a new doctor SOON. I had eaten salmon, and now that you mention it, I have a friend who has to carry an Epi-pen because she’s allergic to fish. Many thanks! You may have saved my life. I will avoid fish until I get this checked out. Sue, That is possible that you are allergic to fish in general. I have a friend who is allergic to all fish (not only salmon) and carries an Epi-Pen. Other seafood is ok because she eats shrimp and octopus. As far as taking care of my health. I did something good today and that is I got a deep tissue massage. She massaged several spots that had knots in muscles which is probably from the busy hectic work life I used to have. After the massage, the therapist advised me to drink water to flush out toxins. It is a small step but I feel better that I took the time to get a massage. Thanks, Estela. I made an appointment with an allergist and will avoid fish meanwhile. Good for you for getting a massage and flushing out toxins!